The Takeaway: Body of Work is an amazing guide to viewing one’s career, creative passions, volunteer projects and family contributions as part of a single life legacy. Young or old, the book can help artists and innovators see their oftentimes diverse experiences in light of a larger, more compelling story. Body of Work author Pamela Slim. The Review: Pamela Slim liberated thousands of office drones from a life in Corporate America in her first book, Escape From Cubicle Nation. 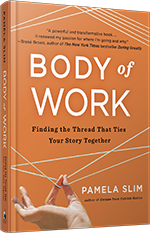 In her new book, Body of Work, she manages to liberate everyone else, by helping readers view their vocation in light of their entire life. Drawing upon the arts metaphor of a body of work, which frames the discussion at a higher level than just “how to get that next job” or “how to start a business.” Slim helps readers examine their root values and motivations in order to better understand the themes of their life’s work, and then discusses the different modes of work in which these tasks can be played out – full-time jobs, contact work, in a business, or as part of a service endeavor. Another chapter of special interest to creative people is the one on collaboration. I realized as I read it that I, like a lot of artists, too often tried to “go it alone” when working on a business endeavor and not reach out for help from people with complementary skills. 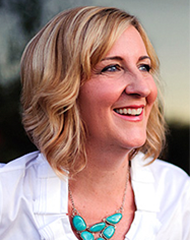 Slim provides examples of the many roles other people can play in our projects, including mentors, smart/challenging friends (who can critique your ideas without crushing you), creative thinkers who will brainstorm possibilities with you, and influencers who can help you move your ideas forward and “sell” them to others. The final chapter on telling the story of your body of work was particularly impressive to me as a writer and editor. My observation is that many creative people struggle to articulate what their work is about. (Some may even feel that if they can articulate it in words, it’s not really “art.”) Slim points out the value of a story that brings across the core themes of your work, and as in the rest of the book, provides useful exercises to help the reader do that while the material is still fresh in their minds. Body of Work is a great book for anyone who wants to feel a greater coherence between their art, their day job, and all the other significant projects they spend their time and life energy on. It’s short and action-oriented, while spurring reflection and evaluation within one’s mind, heart, and soul. Watch the book trailer for Body of Work!